Filing your taxes can be a complicated and intimidating process. For many LGBTQ people, the process is made even more unapproachable because tax software and tax preparation companies seldom have a clear understanding of the credits, deductions, and other issues that are most relevant for members of our community. The National LGBTQ Task Force has put together a fact sheet LGBTQ people can share with their tax preparer to make the process easier. Finding a tax preparer with an in-depth understanding of the financial and personal lives of LGBTQ people can be difficult. That shouldn’t mean that you miss out on claiming credits and deductions that you’re entitled to receive. If you itemize, you may be able to deduct the out-of-pocket cost of transition-related care, including: surgery; reproductive health care, including abortion; and HIV-related care. The IRS checks your name and gender marker against the Social Security Administration’s database. If you adopt a child, you may be able to claim a credit to offset the costs of adoption up to $13,190. For more information on these and other facts important to members of our community, check out the LGBTQ Taxpayer Checklist. You can also find more information about the Earned Income Tax Credit, which helps lift millions of people out of poverty every year in our EITC Fact Sheet. 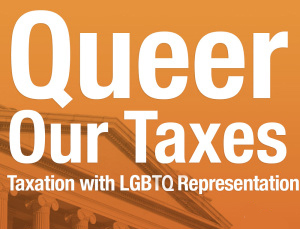 Stay tuned to Queer Our Taxes campaign for more information about how you can get involved with actions to advocate for a fairer tax code that reflects the lived experiences of all LGBTQ people, regardless of family structure, criminal history, or legal relationships with children.